I said it. I desire to live the radical life. What exactly do I mean by that? Basically, I want to live like Jesus lived. And He, my friends, lived radically. Should I, who calls myself a Christ follower, desire anything less than that? I don't think so. The problem though, is that I am much like Paul (aren't we all?). I often do the things I don't want to do and don't do the things I do want to do. My flesh gets in the way. I look at my life currently and think, "Wow, you are so far from radical." And the truth is: I am. I try my best not to compare myself to others, although, let's be real here...we all do that at some point. "Oh, well, at least I'm better than THAT guy over there." Well, ya know what? God doesn't compare you or me to anyone else. He compares us to the standard that He set before us. The beautiful thing about His grace and mercy however, is that it doesn't matter how often or how far we fall short of that standard...He loves us just the same. Thank You, Jesus. If I had to rely on what I DO to gain the love of my Father in Heaven, I dare say I'd be in some deep doo-doo. That, by the way, is the scientific term for "big trouble." As I think about what it would mean to live a radical life, I wonder exactly what that would look like for me. I'm not entirely sure there is a clear right or wrong way to live radically (well, it would depend on your heart). Perhaps it's what simply takes you out of your comfort zone. Outside of my comfort zone. That's a scary place to be. But, I've ventured out a time or two and while it can be a bit scary and overwhelming, it is also quite rewarding. Oh, if I had the boldness to consistently live outside this comfort zone of mine. Why is that so hard? Why is it so difficult to just knock down the barriers and the walls and pop the bubbles that we encase ourselves in? So what does radical look like really? I mean, I can think of some examples that pop into my head when I think of radical. Stephen in the bible (the first martyr) was a radical, stoned to death for refusing to stop preaching the name of Jesus. Paul and Silas were radicals, being persecuted for preaching Jesus, and worshipping even while being imprisoned in chains. Even my own Pastor comes to mind as I think of how he never locks his door, deciding that everything he has belongs to God anyway so if someone else just wants to come take it, they can have it because they obviously need it more than he does. That's radical to me. And while I'm being honest, I am so not close to even having that kind of "let me keep my doors unlocked" mentality. And, I would probably be whining and complaining if I were thrown into prison like Paul or Silas. I'm nothing if not transparent, people. I've been a "Christian" since I was 5. I use the term "Christian" loosely because let's face it, I haven't always behaved like a Christian. People toss that word around so nonchalantly. So many think that just going to church on Sunday and having your "Jesus card" stamped makes you a Christian. Yet, out of their mouths spews profanity or negativity or criticism. They don't love. They don't forgive. They don't simply CARE. And let me be the first to stand up and say that I have been that "Christian." Many times they are called hypocrites. Oh, how many times I've been one. But that's not my desire. My desire is to show love like Christ showed love, to those least deserving. My desire is to forgive even when it doesn't make sense, like Christ forgave me while He was hanging on that cross. My desire is to care about the lost and the broken, every single one, the way Christ cared and healed and listened and served. I want to serve. I want to serve radically. I want to serve so that others might ask, "Why do you do that?" That's the question that would open the door for me to tell them about my Jesus. That's the question I want to answer. Jesus. Just Jesus. I want to live for Jesus. And I think, in my tiny little mind, that living FOR Jesus means living radically. What are your thoughts? What does radical look like to you? I'd love to know. Yes, I want to live like that. Throughout the Old Testament, the veil in the temple separated the part of the temple where people were allowed to be from the Holy of Holies, God's dwelling place, and the part of the temple that only the priest was able to enter into once a year. It signified the separation that sin had caused between man and God. But, when Christ died that horrible death on the cross for you and for me, that veil that separated us from God was torn completely. The torn veil allowed all people full access to God. Jesus paid the price, the proper "atonement" for our sins. The debt was paid....in full. It was as if, in that moment, God took the note our debt was written on and tore it in half. One of the things our Pastor speaks about often is how so many Christians seem to walk around living defeated lives. I dare say I know a few who seem to live this way. And while I'm daring to say things, I dare say I've been one of those people myself. Why do we forget the very words that were written to us in Hebrews? "Let us come BOLDLY before the throne of grace." Did Christ not die for this very purpose? In the moment that my Savior gave up His spirit on the cross, He opened the doors to the throne room of God and told me to enter boldly. Why then do so many people who call themselves Christians continue on in defeat? You are not defeated! You are "more than a conqueror through Him who loved us." Lift up your head, dear friend. Yes, Jesus never ever promised that life would be easy. In fact, His very words told us that in this world we would have trouble. It's inevitable. But He also promised that we should not fear. We should take heart for our Savior OVERCAME THE WORLD! It doesn't matter what this life tries to throw at you, how many times Satan tries to steal your joy...we have a Savior who has already defeated him. So do you feel defeated? If so, it's time to stand up, take hold of the power that is inside every Christian, tell the devil that in the name of Jesus he and his brood of demons must leave, and take back your joy. The veil was torn for the very purpose of you and me being able to come before God boldly with everything...no matter how big or small. If you're a Christian, others should be able to see your joy, your hope, your peace. Will life sometimes knock you down? Yes, absolutely...probably more times than you care to count. But, that's the time when you look up and see your Heavenly Father reaching out His hand. In the midst of pain, chaos, oppression, persecution, stress, or illness, others need to see you leaning on the One who defeated all of that. He defeated it all. He tore the veil. He told us to come boldly. So...come. This post was inspired in part by this song by MercyMe....it gets me every time I hear it. If you haven't heard it before, please listen. Then tell me why you should continue on defeated when we serve such an incredible God! This post is somewhat inspired by an old friend's blog. She recently posted about time she spent in college and how much she missed those days. I realized that I, too, have found myself reminiscing and becoming quite nostalgic about times passed. Her words reminded me of a time, already 7 years ago, that I set foot onto the small campus of Southeastern as a student and resident for the first time. I remember meeting my roommate in person. We met through another online blog site that I used to keep up really well in high school called Xanga (anyone remember that?) and we eventually requested to be roomed together. We talked on the phone the whole summer before so I felt like I really knew her well. We quickly became nearly inseparable and I remember fondly the nights we would stay up until 3am laughing, IMing each other back and forth like nerds since we were sitting in the same room, decorating the dorm with flamingos and scripture, dying hair illegally in the communal bathroom (shhh), praying at night before falling asleep, or walking/skipping around campus arm in arm like the silly freshmen we were. We went through a lot that year...or rather, she went through a lot, and I sat helplessly not knowing what to do. Our friendship made it out alive and we kept in touch for a few years afterward but I lost touch with her and haven't been able to find her. Perhaps one day I'll post the story I wrote about her for one of my college writing classes several years ago. Her story is certainly worth telling. And, I received an A! Honestly, though, my memories have taken me even farther back...to high school. Oh, I shudder at the thought. I hated high school. Loathed it, actually. But, I did enjoy the company I kept outside of the walls of that horrendous place...namely, those I went to church with. As a junior, one of the guys that went to our church and I decided to start a bible study. So, every Monday night, 10-15 high schoolers gathered at my house for dinner or snacks and we had bible study. We'd trade off leading each week and then we always separated boys and girls for a while so the girls could talk about what they were going through and pray together and the boys would do the same. I loved that time. Looking back though, I see where some of those people were then, and then I see where they are now - some having completely abandoned their faith - and I wonder if it made a difference. I hope it did with others. I know it did with me. I remember leading worship with my best friend on Wednesday nights for the few months we had a praise band. I remember how devoted we were. If we didn't have daily quiet time or didn't show up for Sunday School or Worship, or a practice without a valid excuse (sickness, out of town) then we weren't aloud to lead. We were serious. So that meant sometimes one of us led without the other or we didn't have a drum player or a lead guitarist. It was the rule we set for ourselves...and we followed it. I wouldn't trade this life of mine for anything in the world. But, I do miss those times. I don't think we always appreciate the times we have as we have them. We take them for granted until those times are gone and you're only left with the memories. Looking back makes me want to appreciate the HERE and the NOW even more. I want to soak up every moment I have now and not take it for granted. I want to be able to look back years from now on these times and say, "Those were times well spent." 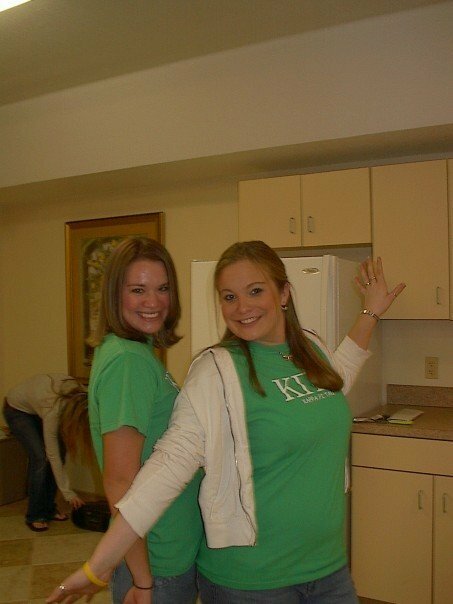 Memories...Charity (bestie I met in college) and I rockin' our Kappa Pi Tau shirts! Not sure why I love this pic so much! How many parents think the dreaded "terrible twos" are actually a myth until they find themselves unwittingly in the middle of a terrible two tantrum? I was in that unfortunate group, thinking, "Perhaps these terrible twos are just a myth. Perhaps my angel won't go through them. Perhaps he will be laid back and easy to handle." HAHAHAHA! Yeah, right. My child? My strong-willed, everything is "mine," active little bundle of energy? No such luck. So, with this new and oh, so wonderful stage (sense the sarcasm? ), I have been reading and researching. I've been trying to find helpful ways of handling tantrums and shriek attacks and Dr. Jekyll/Mr. Hyde mood swings. It all comes down to his temperament. First of all, I have a very active child. But, he's been sick for the last 2 weeks along with us with that nasty cold that seems to be infiltrating every one's immune system these days, so the poor thing has pretty much been all but quarantined inside the house. I think this is our first issue. In order to keep our little guy happy and his temper moments at a minimum, we must make sure he has enough activity. This is tough. Because, let's face it - mommy and daddy don't have near the energy that our little guy has. It's a Catch 22 really. When I get home from work after being with 67 5th graders all day, I'm pretty worn out. I WANT to play with my son, but not always the way he wants. Daddy is with him all day trying to keep him happy, so by the time I get home, HE is exhausted. What's a 2 year old to do? We're trying to work out a plan, a way to be consistent, so that our precious angel will know what to expect when he exhibits certain behaviors. Last night, when we sat down for dinner, we turned off the TV. This is a rule in our house now. When we eat dinner, the TV is off. This never used to bother him, until now. He flips out. We try to ignore it but it is seriously hard. He won't sit at the table when he's that upset, nor do we really want him there when he's screaming and flailing. Sometimes he will get the concept that if he sits down and eats, he will get to finish his show later, but sometimes (like last night), not so much. He ended up being placed in his room until he quit screaming. That was the best solution at the time and probably the best solution for his scream fests. I've not really wanted his room to be a place of time out but when he's acting out like that, I think it's the best option we have - mostly to save our own sanity. So, we've decided that scream fests will be an automatic trip to the bedroom. Do NOT pass go. Do NOT collect $200. Anyway, last night, it worked. Yes, he continued to scream for a few minutes and made our dinner time less than peaceful and relaxing. But, after a few minutes, he calmed down and daddy was able to go in there and talk to him. After that, he was fine. Regular 2 minute time outs in our "special" chair in the dining room will now be reserved for those times when he is simply not listening. That's our 1-2-3-Timeout solution. When he's been told to do something and does not do it, we explain to him that he has until 3 to do it or it's an automatic timeout. Sometimes he'll do it, sometimes he chooses timeout. The good thing is that when timeout is over, I get him to say sorry and then he has to actually go and do the thing that he refused to do earlier (i.e. picking up his toys). In other cases, like when he's torturing the dog or cat and not listening to us tell him to stop, after his timeout he must apologize for not listening and then he usually goes and gives them love. Parenting is tough. I mentioned to my hubby that this whole parenting a toddler thing is like a big merry go 'round of trial and error. We try stuff, see if it works, and if it doesn't, we try something else. It doesn't really matter how many books you read, people you seek advice from, or doctors you consult with, when it comes to your child, you do what works, no matter what anyone else says/thinks (within reason of course). If at first you don't succeed, you cry and cry try and try again. So, while this stage is beyond exciting as he learns and grows and soaks up everything like a sponge, it is also quite challenging. Keeping your cool and your sanity is important so whatever helps you do that, do it. I don't want to be the "reactive" parent that just reacts instinctively when my child does something he shouldn't. That usually results in me feeling guilty later on. Trust me, I've done that one too many times. I want to be the "proactive" parent, one that has a plan in place and knows exactly how she's going to handle certain situations. Sure, there will be times that arise for which I have no plan, and as they come about, I can add to the plan already in place. For instance, he's not really the type to throw a full on tantrum in public - at least, we haven't had the blessing of that yet. He did start to throw a mini one at a restaurant the other day when we tried to put him in his high chair. We simply asked if he wanted to leave. He said no so we told him he had to sit - and voila! It worked! Although it may be inconvenient and frustrating, if he ever does that in a public place, we will have to stick to our guns and simply leave. My mom did it with me as a single parent so surely, together, we can conquer, uhh, I mean succeed. With all this said, I don't know how single parents do it. I don't know how my mom did it. It's hard enough with two parents who try desperately to be on the same page, but for a single parent - nothing but respect for you! Along with consequences, I want to start rewards too. I've been wanting to start a sticker reward book for him that we can take with us everywhere for immediate reward. When he is behaving well and listening and doing what he's expected to do, we want to be able to give him stickers, and then turn those stickers into something tangible for him - a trip to the park, a toy from the store, etc. That's one of my projects over Spring Break. Any specific ideas on how to put one together would be appreciated, but I think I may just go with my instinct and then post the results on here later. In the meantime, tonight I will be watching a free webinar hosted by Amy McCready, who has apparently appeared on the Today Show numerous times to bring positive parenting solutions. I found out about it here and will be tuning in at 9pm to see what sorts of wisdom, advice, and positive tips I can possibly glean from this woman. Hopefully I come away with a new arsenal of tricks to try whilst keeping my wits about me. There's still time to register if you're interested. And for all you other parents of temperamental toddlers out there - hang in there! This, too, shall pass. Right? On my way to work earlier this week, I listened to the Morning Cruise on the JoyFM share their sort of devotional. Carmen was talking about running in the Princess Half Marathon over the weekend and although I missed the beginning of her story, I caught the latter part where she described the last 2 or 3 miles and how tough they were but how the Lord spoke to her in those moments telling her that this was how she would enter the kingdom: battered, bruised, broken, and exhausted. As I listened, I realized that is exactly how we all should enter the kingdom. Nay, how we should STRIVE to enter the kingdom. If we are not exhausting ourselves for Christ, then what's the point really? I don't know about you, but I want some rewards when I get to Heaven. I want my Heavenly Father to look at me and tell me how well I've done; how my often sloppy race in my life on earth brought others to Christ. I want to persevere and push on...through the sweat, the blisters, the aching muscles...to the prize waiting for me at the end. The glorious day I see my beautiful Jesus. The ultimate prize. As I reflect back on the part of the race I've completed, I can see the paths that were the toughest....the paths that took me through thick brush, desert sand, or pavement littered with pot holes. I can see where I fell and maybe skinned my knees but eventually got back up. I can see where I veered off the path and rested a while, thinking there was no way I could go on, but eventually jumped back in the race. I can also look ahead and I can see how difficult the rest of the race will be but I see all the other runners too, some far ahead of me that I am trying to catch up with, some far behind me that I am trying to spur forward. The participants of this long and crazy race are all at different mile markers. Some are more battered and bruised than others. Some struggle for every breath, while it seems others run with grace and dignity. No matter how you "run," how slow or crooked your gait might be, keep running. Don't stop. I won't stop. I'll fall for sure, a million times. It's okay. You can fall. There are other "runners" along the way that will help you up and will "run" alongside you encouraging, motivating, lifting you up. I've met many who have done the same for me and I can only pray that I can be the same for others. Remember your prize. 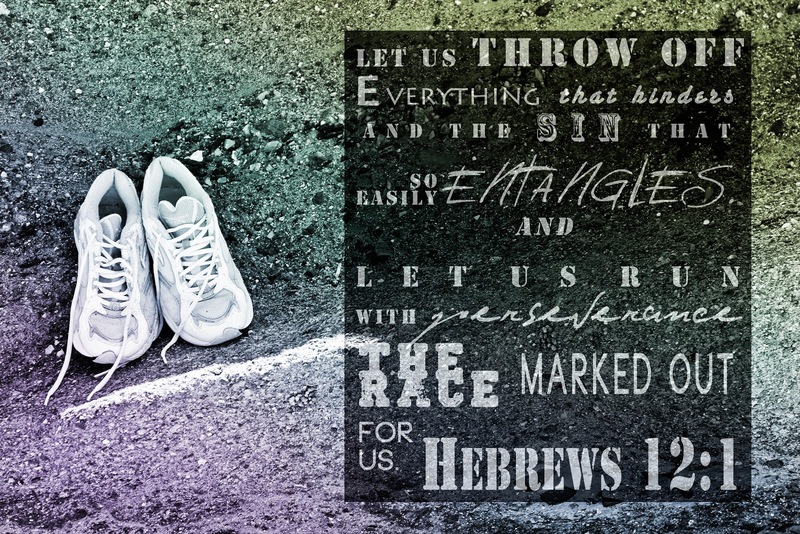 Remember what Who is waiting for you at the finish line. We should all be running for Him, to Him. Run that race, friend. 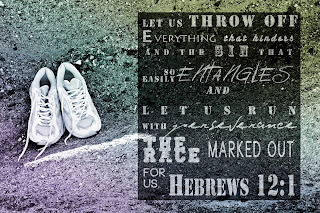 Run that race, and don't stop until you see His face. Tighten those shoe laces, friends. Let's run this thing!